The Atlanta Falcons have rediscovered their running game late in the season and it has come from an unexpected source. The Falcons nearly rushed for 200 yards for a second straight week — settling for 195 — and beat the Carolina Panthers 24-10, giving Atlanta its second straight win. It was the seventh straight loss for Carolina and the second time this season the Falcons have beaten the Panthers. The bulk of the yardage came from Brian Hill, who got a chance to play when rookie Ito Smith injured his knee last week and was placed on injured reserve. Hill ran eight times for 115 yards, not far away from his career total of 164 yards in 16 previous games, and had a long run of 60 yards. Tevin Coleman, who rushed for 145 yards a week ago against Arizona, added 51 yards on 10 carries. The game benefited from changes on the offensive line; rookie Ty Sambrailo started at right tackle and Zane Beadles started at right guard. The running game partnered with Matt Ryan, who threw for 239 yards and three touchdowns and was sacked only one time. Ryan threw touchdowns to Julio Jones (four catches for 28 yards), Calvin Ridley (three catches for 90 yards) and Mohamed Sanu (five catches for 81 yards). The Atlanta defense came to play, too. They came up with three interceptions to help ruin the first career start for Carolina quarterback Taylor Heinicke, who completed 33 of 53 passes for 274 yards and one touchdown. But Jack Crawford intercepted one pass to stop a Carolina scoring drive before the half. Brian Poole and Isaiah Oliver came up with interceptions, too, and Oliver recovered a fumble caused by Deion Jones. It offset any momentum the Panthers had been able to build, even though they rushed for 141 yards and controlled the clock for 37:29 minutes. 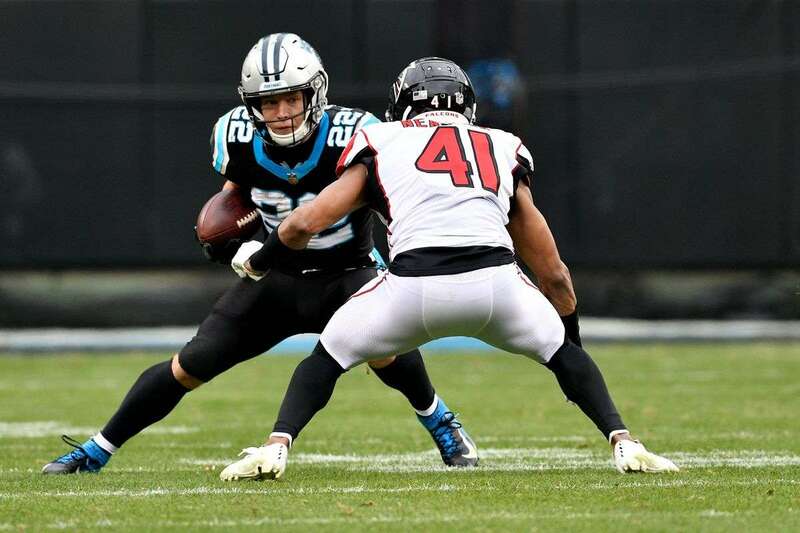 The Falcons were able to keep Carolina running back Christian McCaffrey off the board, even though he rushed for 101 yards and caught 12 passes for 77 yards. McCaffrey has 106 receptions. He became the third running back in NFL history to rush for 1,000 yards and catch 100 passes.